Don&apos;t be chicken! Use this stock because it&apos;s real good and Simon means real good. He&apos;s made it by roasting chicken, cooking vegetables and reducing the liquid until it has a beautiful flavour. He&apos;s called it Executive Chef strength stock because this little pouch is packed with flavour and makes two litres of restaurant quality stock. So get cooking. 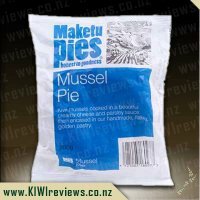 100ml resealable pouch - refrigerate after opening for up to 3 weeks. This stock concentrate makes up to 8 cups or 2 litres of stock. Stock isn&apos;t something that I use a lot of when cooking , as I tend to use other ingredients in regards to creating flavour in my dishes. However we had been out for dinner at a restaurant and my partner had purchased the chicken dish which came with a side of risotto which he really enjoyed. 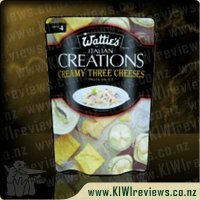 He compared this to the usual rice risotto that we buy in a packet and cook this way and said how it was amazing in comparison and asked me if I could make my own scratch at home ... it somehow seemed that the packet of this was no longer good enough. Searching high and low over the internet I finally settled on a recipe that sounded tasty, and had good reviews the recipe called for chicken stock, so I went off to the shops are returned home with Simon Gault&apos;s Home Cuisine - Chicken stock. The first I noticed upon returning home with this stock was that it came in a resealable bag, this I thought was a great idea especially for a liquid which is normally something that is able to be resealed unless in a bottle of course! This was perfect as the stock had a 3 week refrigeration life once opened, although to be honest I choose to freeze the remainder of my stock in ice cubes as I knew I probably wouldn&apos;t get through the rest of it over this time frame. After cooking up my chicken, bacon and vegetables - mushrooms, corn, peas and carrots I added my rice and then added 2 cups of stock (which I had previously mixed with water to create), due to the fact that the stock didn&apos;t have the strongest chicken smell I opted to add a couple of extra squirts into the water for extra flavour. The meal simmered away nicely and I was pleased to see the stock didn&apos;t just vanish before my eyes, but that it was absorbing into the other ingredients, you could see the colours of the chicken changing as the stock thickened slightly and the rice just puffed up nicely. 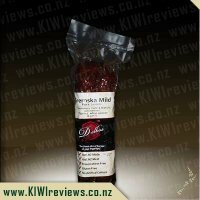 The flavours, well the flavours were amazing so much more flavorsome than any powdered or cubed stock I have used in the past, and the whole family loved it. Is this something I will buy again? Yes, definitely I think i&apos;ll buy another pack if I manage to come across it on special just in case! 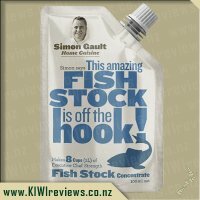 To be honest I was sceptical about the Simon Gault Chicken stock as a loyal stock cube user. I decided on a One Pot Farmhouse Chicken Recipe that included 250 ml or one cup of chicken stock. I loved that the stock was in a resealable pouch, clearly labelled and the instructions were clearly set out as well as easy to follow. I noticed the stock did not have a very strong aroma so added extra stock than recommended. This improved the aroma and it lingered right through the cooking time. The recipe was a hit with everyone except Master Three having a second serving. 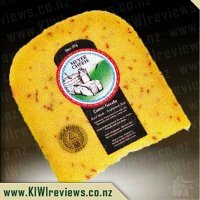 I think the fact that you can seal the packaging is a huge advantage, as well as the clear labelling. The price is reasonable and 8 cups of stock is a good amount for the price. It is very easy to use which is always a bonus! I also like that you can also squirt some of the contents from the pouch directly in to any dish that requires a bit of a flavour boost. I also used the stock in my Pumpkin Soup recipe and was not let down, it was delicious! Simon Gault will not let you down! Ok, confession time, I&apos;m not that young and Ive never, ever, used stocks of any kind in my cooking. Ive always just used good ole fashioned water. I have seen many different brands of stock at the supermarket, but not purchased as hubby does not see a need for them. 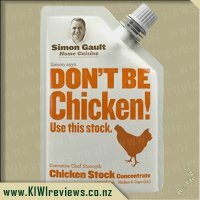 So strangely enough I was really, really excited to receive the Simon Gault chicken stock to review from KIWIreviews recently. 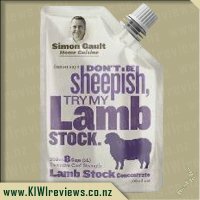 I love all of the Simon Gault range of seasonings and stocks I have tried so when the chance to review a new one came up I was keen to take it. I love that the packets are resealable and can be kept in the fridge for later use so there&apos;s no waste. 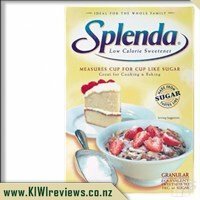 When you first look at the price it does seem a little expensive for such a small packet but when you take into account that the one small packet makes 8 cups it&apos;s good value for money. Being one of the coldest and wettest weeks in ages there was no doubt in my mind what I was making with the stock, a huge pot of chicken and vegetable soup. I decided the best was to test out the stock was to let that be the main flavour so I just grated a pile of vegetables made up a few cups of stock and threw it all together. The results was one very tasty soup which had the right balance of flavours, it didn&apos;t even require lots of extra seasoning like most stocks do. The soup was a hit with everyone who tasted it and it had the real homemade taste about it, it was so much quicker and easier than normal homemade soup as I didn&apos;t have to spend forever making my own stock. I will be buying the chicken stock again for sure it&apos;s so much nicer than other chicken stocks I have tasted. I love the fact as well as making it up if you just need a bit of an extra boost of flavour you can squirt it straight into your cooking. yum yum yum! What more can I say this stock was absolutely to die for and I will be using it time and time again. I pondered on what to make with it to start with and decided upon a chicken rice risotto to which I would add the chicken stock to give the risotto a bit more flavour. I was pleasantly surprised by the ease in which the stock came out of the packet. Love the fact it has a wee spout and that the pouch is really flexible. That way there is no wastage of this product as you can fold it over when it starts to get empty and make sure you get every ounce of that goodness out of the packet. Once I had added the stock to the rice risotto I added in a small amount of water to thin it down. I was worried that this stock would be really salty as most stocks from the supermarket have a huge amount of salt in them and I am not a big salt fan. The smell that wafted from the pan while I was cooking my risotto was amazing. It smelt just like roast chicken and what was amazing was that I didn&apos;t have to slave over a stove for ages making a stock from scratch. The real test was what it tasted like in the final product. It was AMAZING! It wasn&apos;t salty or over powering, it was a nice gentle flavour that tasted like I had made it from scratch. It tasted like it belonged and made my meal taste like a nice home cooked meal from scratch when really it didn&apos;t take that long to throw together. 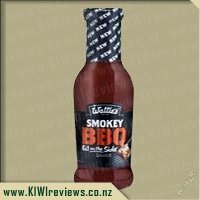 I love this stock and have added it to my shopping list to purchase more flavours. 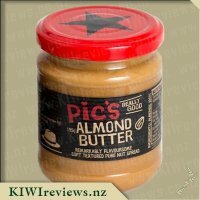 It is going to be one of the staple items in my cupboard over winter from now on. The other night I used the Fish Stock and I loved it. It was nice and liquidy and came out perfectly. I am not sure if its because my husband put in the fridge before we used it and it solidified or if this is the way it is suppose to be but I had real trouble with this. I made a chicken, mushroom and sweetcorn soup. After boiling my two cups of water I went to pour this in, expecting for it to flow but instead I had to squeeze with all of my might to get the smallest amount out. It bloobed out like mud and took me ages to get 25mls with. It also didn&apos;t dissolve as well as the fish and instead had a lot left over in my measuring cup. The smell reminded me of chicken chips and I have to admit I got excited. The fish was so strong and so I wanted a strong chicken base and added a couple more squirts. All in all would of used over half of the packet. Unfortunately when we had the soup tonight it really was not that chicken flavoured at all. I expected way more of a taste explosion than what I got. Next time I will keep out of the fridge for a period of time before using and see if that helps desolidify it. It does say to keep in the fridge for up to three weeks. But like I said unsure if this is the way it is suppose to be. Either way my soup was a success and both girls had seconds and wanted thirds. Cut them off and hoping enough for tomorrow night - hubby still to trial. This is the second of Simon Gault&apos;s stock concentrates that I have been lucky to try. I am totally sold on the idea of using good quality stock for soups. In fact, I am now so excited about making soups for my family as it is not something that has previously been on my list for family meals to create. The kids have loved what I have made and it was so simple. Previously, we have made our own chicken stock by boiling up chicken carcasses after we have taken the meat off them for dinner. This has been fine up to now. The bar has been raised for me after trying a soup with Simon Gault&apos;s Don&apos;t Be Chicken stock concentrate. 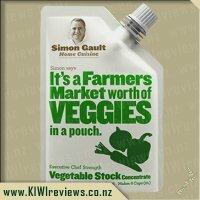 I think I will need to put a bit more thought into what goes into my chicken stock after tasting Simon Gault&apos;s product. Perhaps it will be easier just to keep some of his chicken stock in my fridge. I used the stock to make a chicken and corn soup. It was so simple to make. I purchased a cooked chicken from the supermarket and boned it out, I made up the full two litres of stock from the pouch and then added in some potato, corn, chicken and whisked egg and it cooked a way for a bit. It was really as simple as that to make a belly warming soup that the whole family loved. 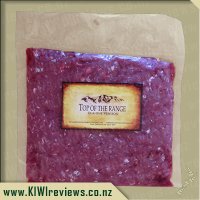 The stock comes in a handy pouch, which can be kept in the fridge for up to 3 weeks once it is opened. I would think that is ample time to use it up. If not, they I would simply pop it in the freezer until I needed it again. In most cases, I would use it to make up a family sized soup and would therefore use the entire contents of the pouch in one shot. It is very simple to make up the required amount of stock and the instructions tell you how to make up 2 cups of stock, which can easily be multiplied in order to create more cups of stock. 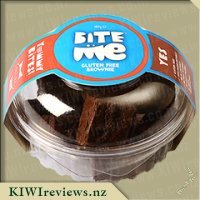 The ingredients are simple and pretty much what one would expect to see in such a product. 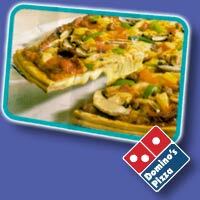 It is great to see that there are no preservatives and that it is 99% fat free. This is a total winner in our house and I think I will have to search through the recipes on Simon Gault&apos;s webpage to see what other tasty meals I could whisk up with his delicious stock. I will be finding this in the supermarket as I WILL be needing it again. 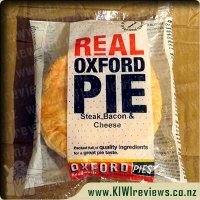 What could be better than a Kiwi classic like a Steak & Cheese pie? Nothing... Unless it&apos;s a Steak & Cheese pie with BACON! &apos;Nuff said.